Actress/singer/director/writer/composer/producer/designer/author/photographer/activist Barbra Streisand is the only artist ever to receive Oscar, Tony, Emmy, Grammy, Directors Guild of America, Golden Globe, National Medal of Arts and Peabody Awards and France’s Legion d’Honneur as well as the American Film Institute’s Lifetime Achievement Award. She is also the first female film director to receive the Kennedy Center Honors. Below is a comprehensive list of Barbra Streisand's awards over the years. The list is in ascending order by year. It features awards that Streisand WON or was PRESENTED (i.e. not nominations). You can jump to a year by using the key above (“Awards By Year”). Click on the star icon to return to the top of this page. 1977: Best Song, "Love Theme from A Star Is Born (Evergreen)"
1965: Best Female Vocal, "People"
1978: Best Pop Female Vocal, "Love Theme from A Star Is Born (Evergreen)"
1978: Song of the Year, "Love Theme from A Star Is Born (Evergreen)"
1977: Best Original Song, "Love Theme from A Star Is Born (Evergreen)"
Streisand tied for this award with actress Sandy Dennis. State of Israel Freedom Medal Streisand received the Israel Free dom Medal in a special ceremony luncheon at the Hollywood Palladium on Oct. 17, 1968. Streisand and Fred Astaire were named Stars of the Year on Dec. 15, 1968. ASCAP Pied Piper Award The ASCAP Pied Piper Award is given to entertainers who have made significant contributions to words and music. Quigley Poll Top Female Box-office Star The Quigley Poll, conducted every year since 1932, is an annual survey of motion picture exhibitors, which asks them to vote for the ten stars that generated the most box-office revenue in the preceding year for their theatres. Photoplay "Gold Medal" Award Favorite Movie Actress Photoplay was one of the first American film fan magazines. Its yearly awards for both the film of the year and the most popular stars were determined by the Gallup Poll company. Telegatto Award The Telegatto ("gatto" or cat) is an Italian television award presented by the weekly magazine TV Sorrisi e Canzoni, and voted on by (at the time) 8.5 million readers. The Anti-Defamation League (ADL) fights anti-Semitism and all forms of bigotry in the U.S. and abroad through information, education, legislation, and advocacy. You can download Barbra's speech for free over at iTunes. Christopher Awards Rescuers: Stories of Courage - Two Women The Christopher Awards honors writers and producers of books, motion pictures, and TV specials for displaying the highest values of the human spirit, as well as artistic and technical proficiency. Streisand served as Executive Producer on Rescuers. ASCAP 15th Annual Pop Music Awards On May 18, 1998 ASCAP honored Barbra and her co-songwriters and music publishers for the song "I Finally Found Someone" — which was among the most performed songs in the ASCAP catalog for the 1997 ASCAP survey year (October 1, 1996 through September 30, 1997). Over 700 leading songwriters, recording artists, and music industry notables gathered at the Beverly Hilton Hotel to salute the songwriters and publishers of ASCAP's most performed songs of the year at the black-tie gala, hosted by ASCAP President and Chairman Marilyn Bergman. ASCAP 13th Annual Film and Television Awards Held April 28, 1998 at the Beverly Hilton Hotel, ASCAP honored Barbra Streisand and other songwriters, composers, and publishers responsible for the most-performed ASCAP music in film and TV. Along with her "I Finally Found Someone" colleagues, Barbra received recognition for the song's high number of performance credits during ASCAP's survey year (see above). In addition, Marilyn Bergman (ASCAP chairman and president), Alan Bergman, Quincy Jones, and Norman Jewison presented Oscar and Grammy-winner Michel Legrand with the Henry Mancini Award for Lifetime Achievement to honor his extensive musical contributions and outstanding achievements as a composer. UK's Mojo magazine 100 All-Time Family Favourites Barbra Streisand ranked 30th on this list, which was reported by London's The Times newspaper on 8/15/98. The survey of 5,000 music fans of all ages and tastes was conducted by the British Market Research Bureau, which compiles England's pop charts, between April 23 and May 23, 1998. Grammy Hall of Fame Single (Traditional Pop): “People” To qualify for the Hall of Fame, a recording must be at least 25 years old and of lasting qualitative or historical significance. Barbra Streisand was named the century's best female singer in a Reuters/Zogby poll of 916 Americans. Conducted between April 5 and 7, 1999, the poll placed no particular weight on a single age group. Participants were at least 18 years old. The top ten responses in the female category are as follows. Frank Sinatra topped the male category with 21.2 percent, followed by Elvis Presley with 8.7 percent, Garth Brooks, Luciano Pavarotti, Elton John, Bing Crosby, George Strait, Nat King Cole, Perry Como, and Luthor Vandross. Library of Congress Living Legend Award Streisand did not attend the Washington, D.C. ceremony. President Clinton presented Barbra Streisand with the prestigious National Medal of Arts in Washington, D.C. on December 20, 2000 at D.A.R. Constitution Hall. First Lady and Senator-elect Hillary Rodham Clinton offered introductory remarks and introduced her husband, who followed with a brief speech and then presented the individual medals to 12 recipients of the National Medal of Arts, all of whom he selected. The trustees of the American Film Institute selected Barbra Streisand to receive AFI's 29th Life Achievement Award. Streisand did not appear on stage to accept the award; she, instead, performed “You'll Never Walk Alone” to close the show and talked to the press afterwards. First Annual Jewish Image Awards Streisand received the award for co-executive producing the April 2001 Showtime film Varian's War starring William Hurt. She was also one of the financial underwriters of the first awards ceremony held in Los Angeles on October 30, 2001. 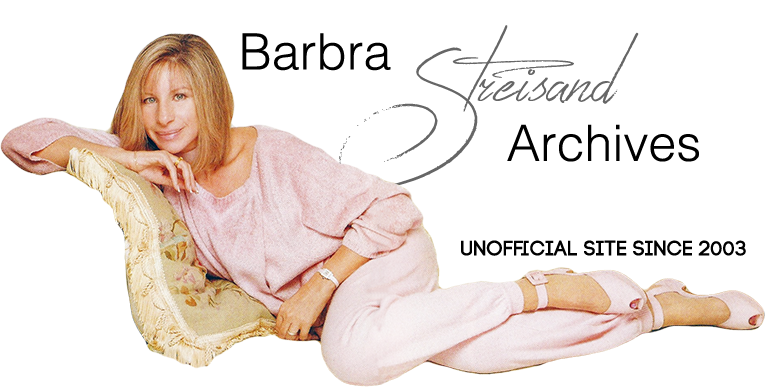 March 7, 2001: RIAA and NEA compiled a list of the 20th century's 365 most historically significant recordings, including Barbra Streisand's 1973 rendition of "The Way We Were" at #298. The Songs of the Century project is a nationwide education initiative intended to promote a better understanding of America's musical and cultural heritage in our schools. To qualify for the Hall of Fame, a recording must be at least 25 years old and of lasting qualitative or historical significance. Barbra Streisand, the Craig Zadan and Neil Meron producing team, and the Latino organization Bienestar were honored by HRC at their annual L.A. dinner March 6, 2004 at the Century City Plaza Hotel. Streisand received the Humanitarian Award "for her years of leadership, vision, and activism in the fight for civil liberties, including religion, race, gender equality and freedom of speech, as well as all aspects of gay rights." French President President Nicolas Sarkozy presented Streisand with the medal of the Legion of Honor. Presented in Washington, D.C. on December 6, 2008. The National Museum of American Jewish History "Only In America Hall of Fame." Streisand's statement about being inducted: "The museum tells an important Jewish story, but it also underscores the fact that our country affords Americans, regardless of their religion, creed or ethnicity, the freedom to live, achieve and contribute in their own way to the culture and spirit of America." "The California Hall of Fame is a great way to honor amazing Californians whose dedication, determination and courage have helped shape this state," said Governor Arnold Schwarzenegger. "What they have accomplished reminds us all that we live in the greatest state, one of opportunity and prosperity. They make me proud to call California home, and proud that they are this year's inductees." "California is known for its beauty, diversity and creative community," said Barbra Streisand. " It's respected for its leadership in scientific research, environmental awareness and regulation. But to me, for most of my adult life, California is simply home. Thank you to the State of California for honoring me as an artist and a citizen." Grammy 2011 MusiCares Person of the Year Awarded with an all-star concert on February 11, 2011 in Los Angeles. Barbra was given the award for her efforts on behalf of women's heart health and her many other philanthropic activities. "Barbra Streisand's leadership allows us to dedicate significant resources to women's heart healthcare education and research," said Eduardo Marbán, MD, PhD, director of the Cedars-Sinai Heart Institute and the Mark S. Siegel Family Professor. "With heart disease the No. 1 killer of women, we need this level of significant investment to find innovative solutions." 18th Elle Magazine Women in Hollywood L'Oréal Paris Legend Award The event, held by the fashion magazine to honor women's achievements in film, was held October 17, 2011 at the Four Seasons Beverly Hills Hotel. Awarded at Avery Fisher Hall, New York on April 22, 2013, and presented to Barbra by President Bill Clinton. The 23rd annual Women of the Year Awards were held at Carnegie Hall in New York City on Nov. 11, 2013. Streisand accepted the honor at the 29th Annual ASC Awards gala, Feb. 15, 2015 at the Hyatt Regency Century Plaza. “Born in Brooklyn to middle class Jewish family—I didn’t know you were Jewish, Barbra,” Obama joked to Streisand, as he presented her with her award. “Barbra Streisand attended her first Broadway show at 14 and remembers thinking, ‘I could go up on that stage and play any role without any trouble at all.’ That’s what’s called chutzpah,” Obama added.